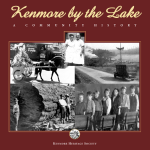 Kenmore’s busiest intersection was less hectic in the good old days! 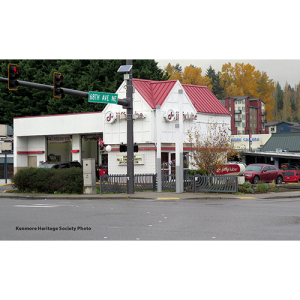 The main intersection in downtown Kenmore, at 68th Ave. NE & Bothell Way, has seen many changes over the years. One of the earliest known enterprises was a dance hall, built by S.E. Hitsman, that opened in 1917. Only two years after opening, however, it burned to the ground in the spring of 1919. It was located on the northwest corner of the intersection. In the fall of 1919, Sarah and James Mitchell built a grocery store on the site of the burnt-out dance hall. The Mitchells lived in a tent while clearing away the charred debris of the hall and building their business. This grocery and general merchandise store was the first of its kind in Kenmore, serving a growing need for commodities. After several successful years, the store was leased to a man named Himbercourt, and then to another named Elder for three years. After Elder’s lease expired, the Mitchells’ son, Delancy, and his wife Georgie took over the store and made it a family enterprise again. They renovated the building in 1934, and the Mitchell store continued to serve the community until 1946 when it was taken over by Antell’s Grocery. Charles Antell died in 1950. 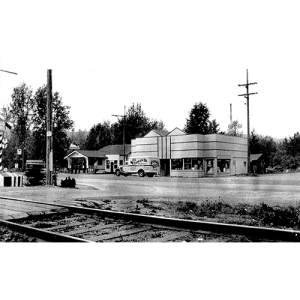 In 1957 the Union Oil Company purchased the corner site for a Union 76 service station. That facility was replaced by Jiffy Lube in the 1990s. The Mobil Gasoline station, located adjacent to Mitchell’s store, was owned by Edward and Eliza Mahler, parents of Sarah Mitchell. The Mahler’s operated the gas station from 1920 until 1946 when Mr. Mahler died. The railroad tracks visible in the foreground were laid in 1885 as the Lakeshore & Eastern Railway. It reached Bothell on Thanksgiving Day in 1887. Nine years later in 1896, it became Seattle & International Railway, based on plans to extend the line to Canada. Northern Pacific Conglomerate took over the railroad in 1908 and trains ran under that banner until 1970 at which time Northern Pacific merged with Great Northern to form Burlington Northern Railway. 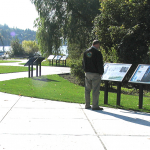 The track was abandoned in 1971 and in 1978, the Burke-Gilman trail opened on the old railroad right-of-way. Photo courtesy of Kenmore Heritage Society. Historic information courtesy of Priscilla Droge.